Department of Kinesiology > News and Events > Events > Congratulations to Dr. Nate Berry! Congratulations to Dr. Nate Berry! On December 6th, 112 doctoral candidates lined up in the cold to march into the UNC Greensboro Auditorium and get hooded. This small ceremony honors the doctoral candidates as they transition into doctors, community leaders, researchers, and scholars. After all, “Doctoral education is the fuel for innovation,” remarked Chancellor Gilliam during his closing statement. Among these honored was KIN’s very own doctoral student Nate Berry and his mentor, Dr. Laurie Wideman. “He has an intelligent, intriguing, and perceptive outlook on things and a deep understanding of statistics, which I don’t have,” jokes Dr. Allan Goldfarb. We wish Nate who “has been a leader and a great team player on NIH-funded projects in Dr. Wideman’s lab” remarks, Dr. Paul Davis, director of graduate studies, all the best and look forward to seeing his contributions in the field of kinesiology! To read more about the ceremony click here. 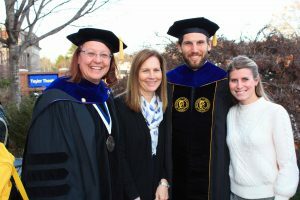 Nate Berry pictured with (from left to right) Dr. Laurie Wideman (mentor), Karen Berry (mother), and Rachel Berry (wife).